I knew I couldn’t go wrong with Hannah Arendt. It can’t get much better than Barbara Sukowa starring in a movie by Margarethe von Trotta. Just recently I have watched another movie they’ve made together – Vision, which was amazing – and I was looking forward to watch Hannah Arendt. The movie is, as I expected, very good, but the title is badly chosen. It would have been much better to call it Arendt on Eichmann or some such thing. With her name as the sole title we’re led to believe it’s about her life while it’s only about her controversial book on Adolf Eichmann and the extreme hostility she experienced after writing it. Philosopher and political theorist Hannah Arendt emigrated to France in 1933 and, after having spent some time at Camp Gurs, emigrated to the US in 1941 where she stayed until her death in 1975. She lived in New York. The movie takes place in 1961. Eichmann had been captured in Argentina by the Israeli Intelligence Agency and brought to Israel to be tried. The New York Times sent Hannah Arendt to Jerusalem to report on the trial. The movie uses a lot of original footage of the trial; we see and hear Eichmann answer questions. And we witness Arendt’s fascination and shock. When she travels to Israel, like so many, she’s prepared to see a “monster”, an extraordinarily evil man, but what she witnesses is, what she later coins “the banality of evil”. What the film shows nicely is how Arendt came to understand that Eichmann was not extraordinary at all. On the very contrary. He was just a man who followed orders without ever thinking or questioning anything. People didn’t react kindly to her interpretation. Surely a mass murderer like Eichmann couldn’t be such a banal creature. But Arendt went one step further saying that without the support of the Jewish leaders the mass extermination would not have been as successful as it was. Of course I knew her position of Eichmann’s banality but I didn’t know she had blamed the Jewish leaders. The uproar and outrage were incredible and for a long time her book Eichmann in Jerusalem was not translated into Hebrew. The movie also touches briefly on her relationship with the philosopher Martin Heidegger, with whom she had an affair when she was his student. Heidegger is a controversial figure because he was affiliated with Nazism prior to 1934. According to the film, Arendt was not only blamed for her positions but for being very cold. The victims felt that in saying Eichmann wasn’t a monster, they were blamed as well. I agree that some of the interpretation of her findings must have sounded harsh and brutal to the victims, but I think the movie also manages to show that wasn’t what it was about. In saying Eichmann was banal, Arendt warned us. She meant to show that it didn’t take extraordinary people for a totalitarian systems to work; ordinary people who follow orders and refuse to think are all it needs. The original footage showing Eichmann is chilling, but without Sukowa’s stellar performance this would only have been half as good. Not a lot of people stood by her side once her articles were published. But she always had Mary McCarthy (wonderfully played by Janet McTeer) and her husband Heinrich Blücher and some of her friends. 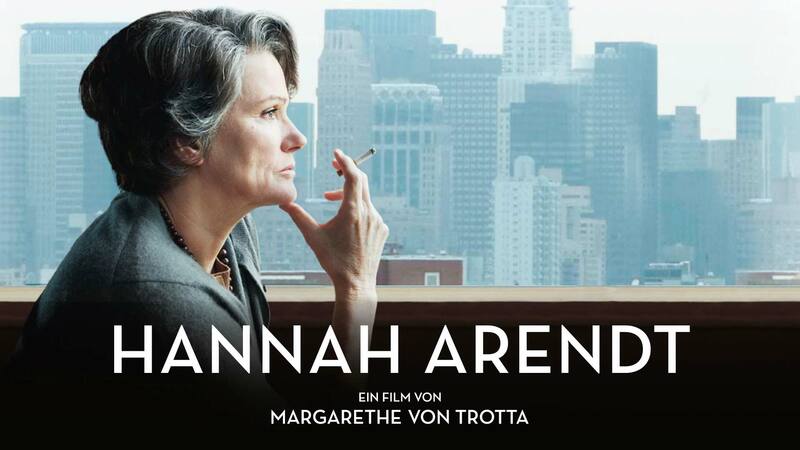 Hannah Arendt is one of the best biopics I’ve seen in recent years. I highly recommend it. For those who don’t like subtitles: a large part of the movie is spoken in English.